Mach is able to produce 2" to 24" diameter pipe in continuous lengths up to 22' 6". 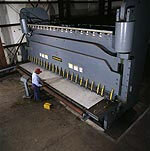 Mach can also produce continuous lengths up to 30' for diameters of 8" to 34". 20" to 144" diameter pipes can be produced in 10' continuous lengths. If desired by our customer, longer lengths can usually be produced through welding continuous lengths together, end-to-end.